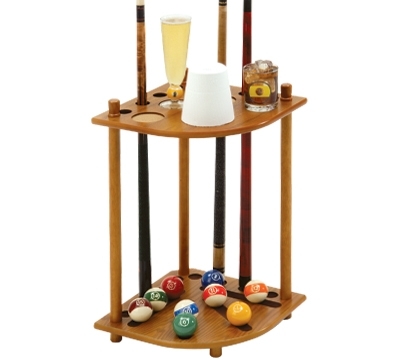 Store your cues, a complete set of balls, and cone talc on this corner floor rack. It features four cork coasters for drinks, and slots for up to eight cues. Made of select hardwood with medium oak stain. Includes hardware, some assembly required. Mueller Recreational Products guarantees the CR61 rack for 5 years against material or manufacturer's defect. Made in the USA.